The San Francisco Bay area has consistently proven to be a prime location for both inshore and offshore fishing. All sorts of fish can be caught in the area, including sturgeon, halibut, rock fish, shark, bass, and salmon. 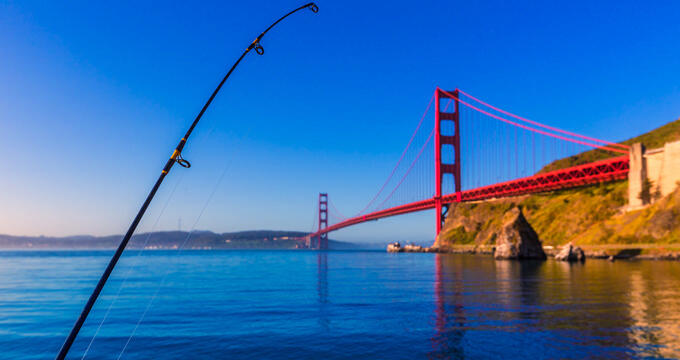 When you head out for a fishing trip in the San Francisco area, you’re guaranteed a great time and a high chance of heading home with a big catch. San Francisco is home to a whole lot of fishing charter businesses, each offering different tours and options to suit all kinds of fishers. No matter what kind of fishing charter you’re looking for, San Francisco will be able to meet your needs. There are plenty of great fishing charter options in this area, and here are a few of the top rated businesses you might choose to fish with. Wacky Jacky provides some of the top rated fishing charter services in San Francisco. The experienced and friendly Captain Jacky Douglas will only be too pleased to welcome you on board and share the benefits of her years of experience. Captain Jacky is a real expert when it comes to fishing in the waters around San Francisco and particularly adept at catching salmon, so if you're looking to land some of the biggest fish in the area, this is a great charter to choose. Fishers on this vessel can also enjoy looking for rockfish, sturgeon, striped bass, halibut, and others, and all of the essential gear and equipment will be provided on board. All you need to do is dress warmly and stay safe from the sun's rays, as well as bringing along your camera to capture any special moments and a set of binoculars in case any whales or dolphins happen to be passing by during your trip. For highly professional and enjoyable fishing charters in San Francisco, Flash Sport Fishing Charters is a name you can trust. This company offers a variety of fishing charters and bay trips, focusing on a wide variety of different fish. Past fishers on these trips have nabbed leopard shark, king salmon, California halibut, rock fish, lingcod, striped bass, and more, so if you're looking to test your skills against a wide variety of marine life, this is a great company to sail with. All you'll need to bring along on these fishing charters is food, drinks, and your own fishing license, with the staff providing everything else on board. These tours are highly welcoming to beginners, as well as being a great choice for experienced fishermen too. Even kids can enjoy these fishing charters, with a couple of specialized speed reels available for young guests. If you'd like to keep d cook your catch, the crew will clean and filet it for you. Having run countless fishing charters over the years, Hook'd Up is another of the top rated fishing business in the San Francisco area. These fishing charters head out around the Bay/Delta area and consistently produce catces of salmon, halibut, and sturgeon, with various other species also often spotted and caught along the way. These fishing charters are manned by the friendly Captain Steven Mitchell, who has been fishing in the waters of San Francisco since he was just a little boy. He holds a Coast Guard Captain's License and has more experience and fishing knowledge than most other captains in the area. Captain Mitchell’s vessel, the Top Gun, is instantly recognizable as one of the best 27' charter boats in the Bay Area, featuring its own private bathroom and other amenities, and anyone on board has a great chance of landing all sorts of catches from bass to sharks. Fishing charters with Hook'd Up provide unforgettable memories and big catches, with the captain always eager to help out newbies and offering full fish cleaning services for those who'd like to take their catches home.